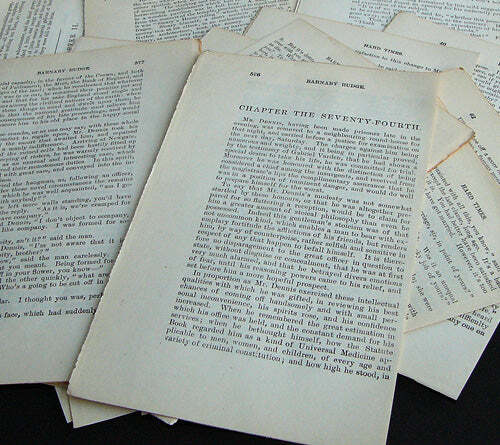 These are loose pages from 1890s/1900s-era editions of novels and storybooks -- mainly Dickens. Perfect for craft projects, papier-mâché or collage! Lovely type and gracefully aged pages, with a little foxing here and there. The paper is very thin so it's hard to count exactly, but each packet is guaranteed to contain between 75 and 125 pages, and we often overestimate just to be sure. All pages contain text, though we cannot guarantee what it is. Some title pages, chapter headings, etc. are assumed to occur. Sometimes the text blocks are preserved in their entirety, and other times the trim goes through the edges of the words. Most of these pages do not contain any images, although a few will! Also available are a limited number of marbled cover boards, complete with leather (?) corners and portions of the binding. These make great sketchbook or journal covers. Each cover is 5.5" x 8.25". The pages themselves are slightly smaller. Everything is only available while supplies last!